Designer Marc Sadler. Ample, linear, essential design combined with strong flexibility characterise the formal elegance and light sophistication of Twiggy. Foscarini reinterprets these details, offering an effective concept for new uses, which preserves all the decorative expressiveness of the original floor version. The table lamp offers in scale the typical flexible refinement of the original creation, while the ceiling model is the maximum expression of flexibility: by rotating 330° it is an optimal solution for decentralising a light source. The hanging version, which comes in two sizes, has a wide range of possible uses. 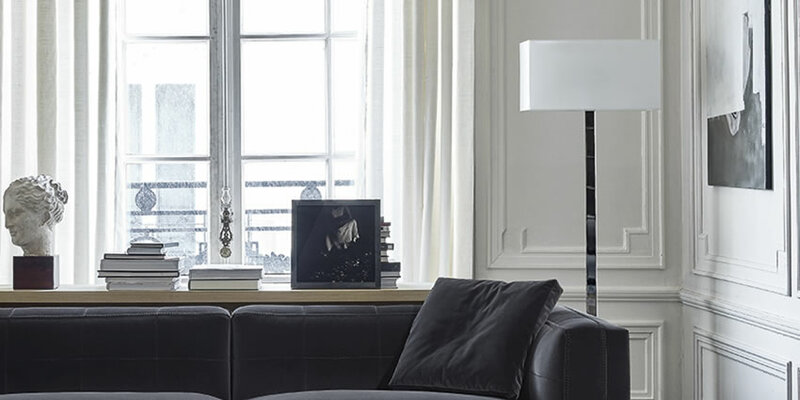 All the lamps are made in composite lacquered material on a fibreglass base and are available in four different colours. The diffuser uses the light source to the full and offers direct lighting on the surface below. 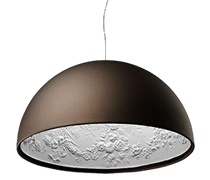 In the large hanging and ceiling versions it also provides effective upward reflection, thanks to the transparent protective upper disk. Designer Achille & Pier Giacomo Castiglioni. "We were thinking about a lamp that shines light onto a table. They already existed, but you had to walk round them. To leave enough space around the table, the base had to be at least two meters away. Which was how the idea for Arco came into being. We wanted to make it with commercially available parts and we found that curved steel angle iron worked perfectly well. Then there was the problem of the counterweight: a heavy weight was needed to support it all. Our first thought was concrete, but then we chose marble because the same weight took up less space, and also because we could obtain a better finish for a lower cost. 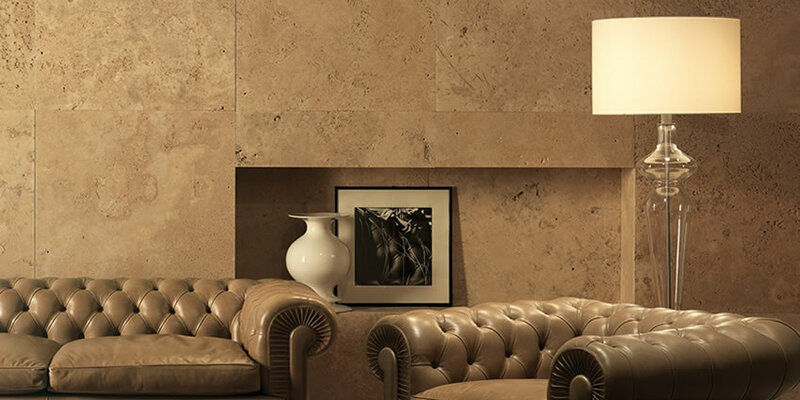 In Arco nothing is decorative: even the beveled corners on the base have a function, which is not to hurt us; even the hole isn’t a flight of fantasy, but to make it easier to lift the base." Designer Michele De Lucchi e Giancarlo Fassina. 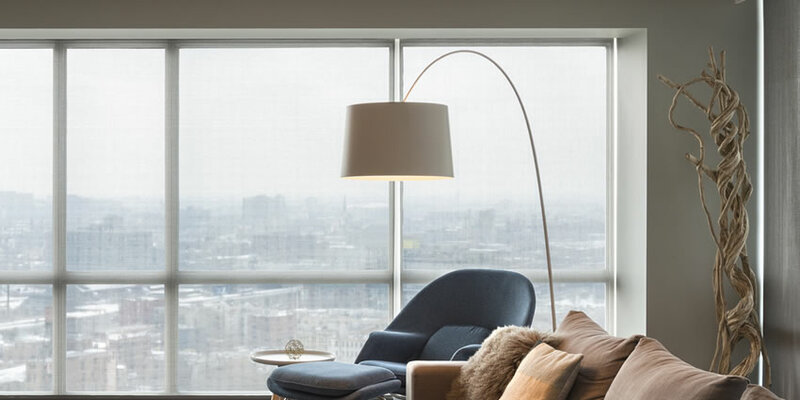 Thanks to its thin arms and conical lampshade, the Artemide Tolomeo Mega Terra floor lamp has become an absolute classic of contemporary design. 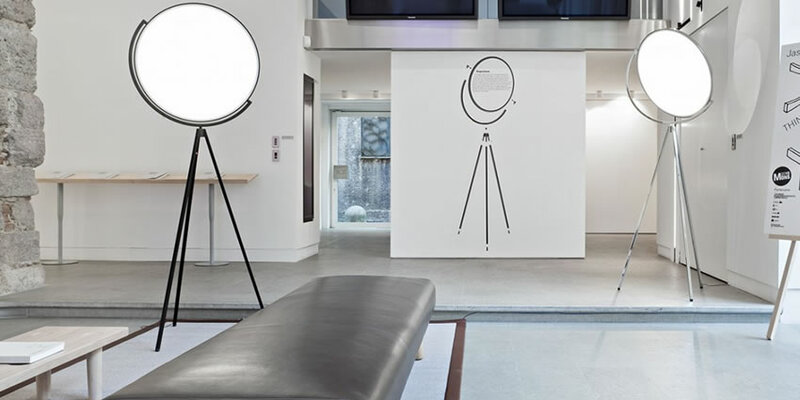 This device is a further member of the Tolomeo family of Artemis, award-winning internationally. 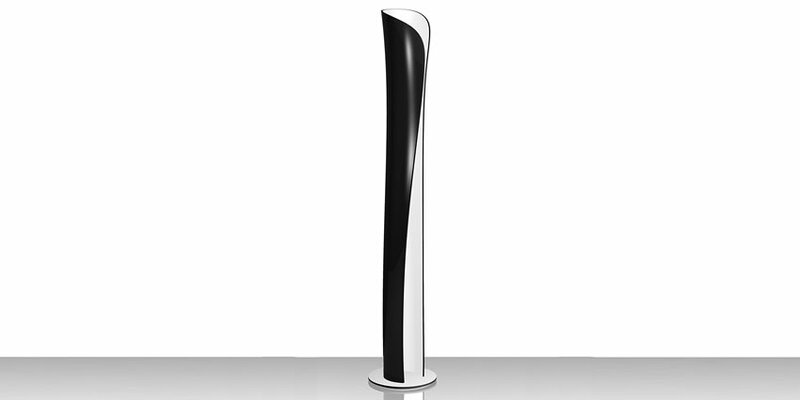 It was also awarded for its proportionate design, including the renowned Red Dot Award. The shade, in the parchment paper variant, is available with a diameter of 32 cm, 36 cm or 42 cm. 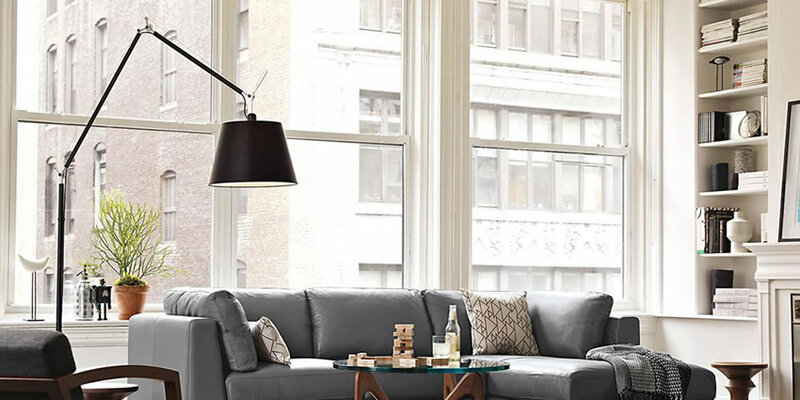 The Tolomeo Mega floor lamp, made of high-quality aluminum, is also offered with a satin (satin) shade. 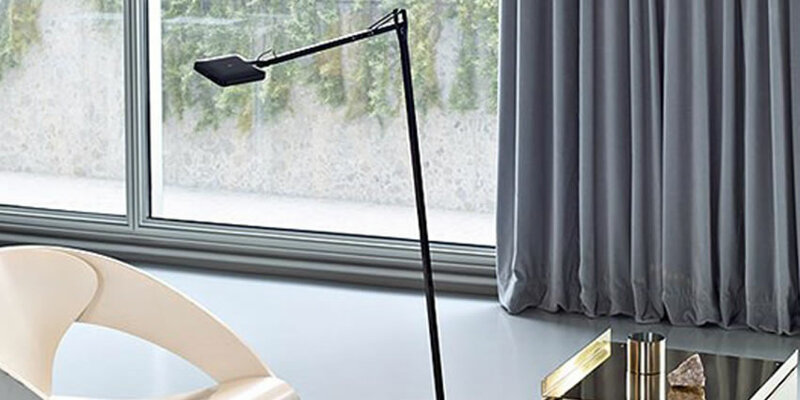 The original model of the Tolomeo series, Tolomeo Tavolo of Artemide, was presented to the public for the first time in 1987 at the international lighting exhibition "Euroluce" in Milan, immediately receiving a great success. Success that was confirmed two years later, when its creators, Michele De Lucchi and Giancarlo Fassina, were awarded the Compasso d'Oro, one of the most coveted awards for designers. Designer Jasper Morrison. Floor standing luminaire with direct light. Body in painted or chromed aluminum, with turned head in slab, die-cast joints and extruded rods. Silk-screened PMMA diffuser. Optical switch positioned on the stem that guarantees the Warm Tone Dimming function. 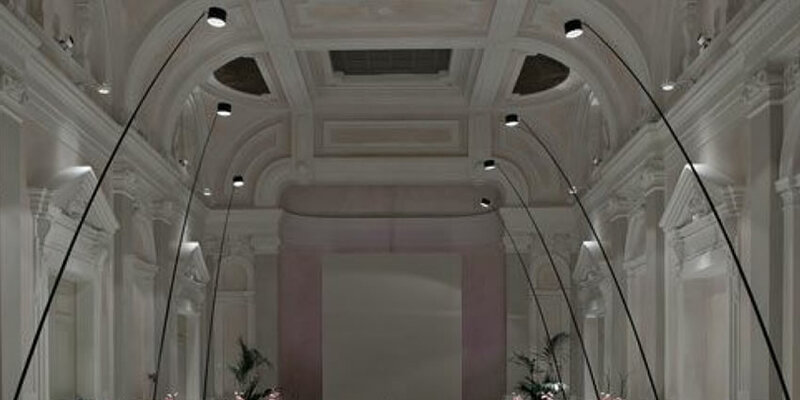 Designer Michael Anastassiades. This collection explores balance. 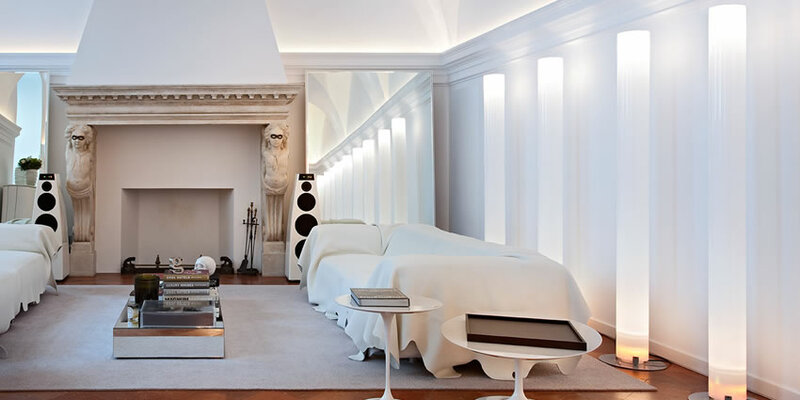 There is a series of lights: table lights, wall lights, ceiling pendants and ceiling mounted lights which take as their basic form a sphere that is perfectly balanced on the edge of a rod. I came across an online video clip of a contact juggler. He was spinning a set of spheres, moving them around on his arms and edge of his fingers. And as I got mesmerized by the magic of his skill, suddenly the spheres look perfectly still. I wanted to capture that exact moment. This was my starting point. The initials IC come from the codes that English police use to define the perceived ethnicity of a person they stop in the street when reporting back to the station. IC1 means white person or Northern European type, IC2 means Mediterranean European/Hispanic, IC3 indicates an African/Afro-Caribbean person, and so on, so this is a playful story to define the different designs. 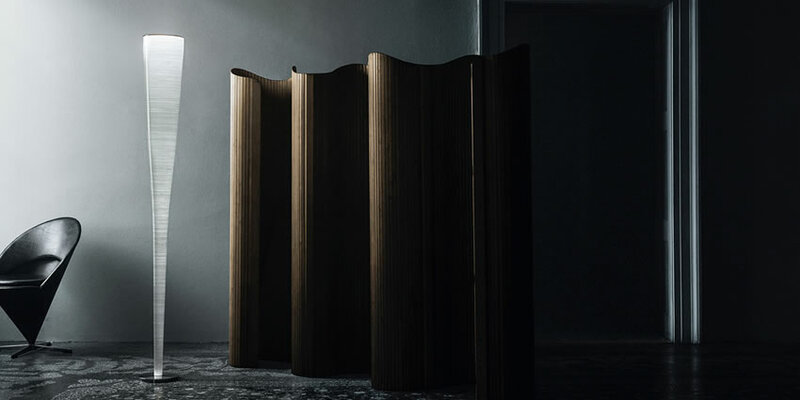 Designer Michael Anastassiades. 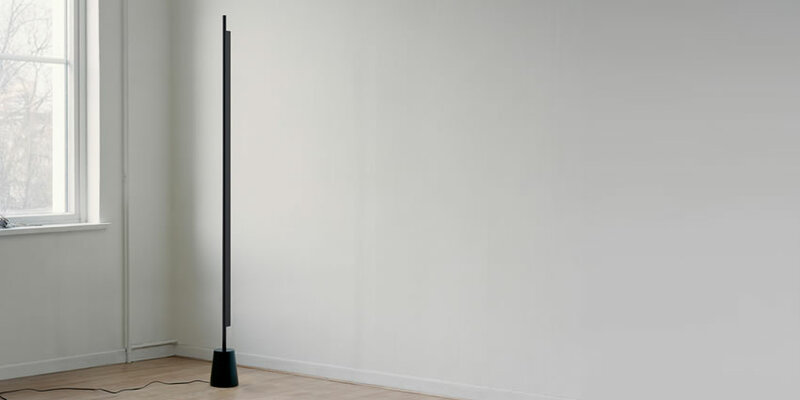 Floor-standing luminaire with directional direct light. 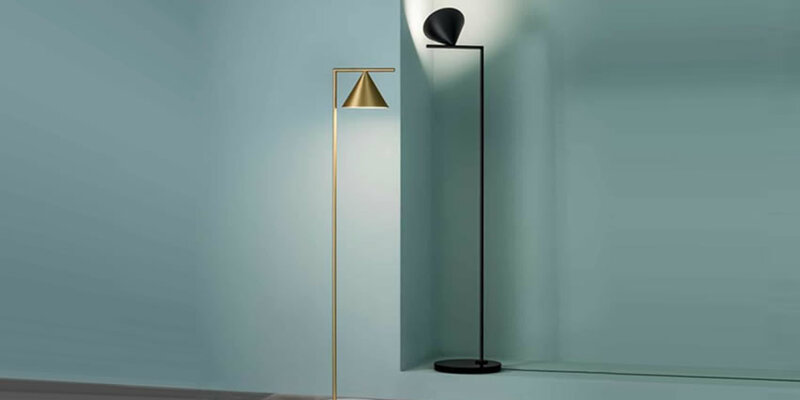 Rod and cone in painted steel or brushed brass. Photo-etched opal polycarbonate diffuser with injection molding. Designer Karim Rashid. Wall lamp, extending the range of Cadmo series. 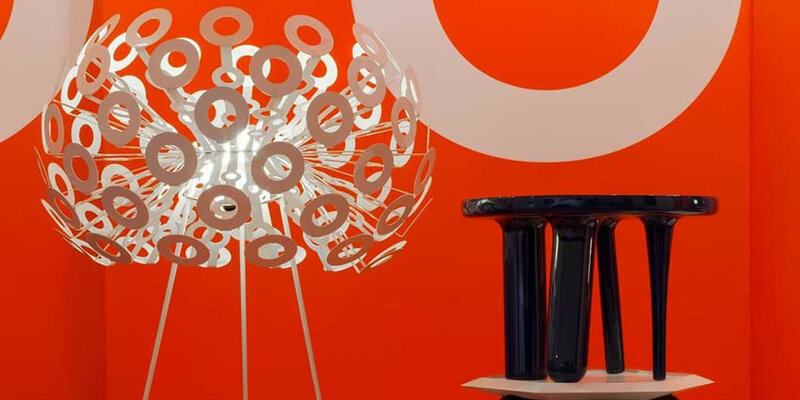 Material: body lamp in injection-moulded thermoplastic material; reflector in optic aluminium. Designer Jasper Morrison. 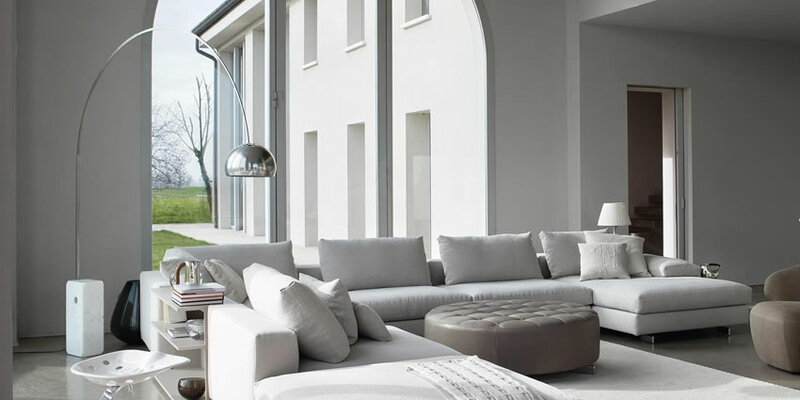 The simple concept behind the Glo-ball family of lights is to obtain the maximum diffusion of light, this is achieved by the use of hand-blown, etched white opaline glass. The form: a flattened globe appears, like the moon, as a flat disc when illuminated. Designer Daniel Rybakken. 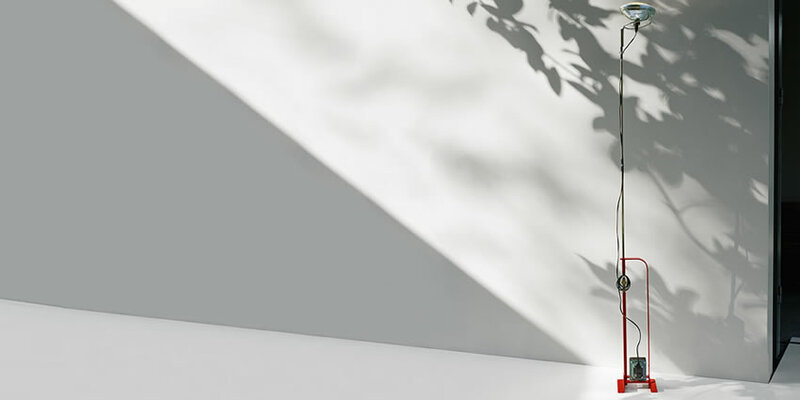 Compendium provides a diffused light in the environment. The body houses a high-efficiency LED source and rotates freely on the base to direct the light towards the wall avoiding direct glare. By Richard Hutten. True to its name, Dandelion was initially inspired by the plant that creates the famous and poetic ‘dandelion snow’ of fuzzy, cotton-like seeds when a gush of wind blows on it. The lamp transmits an explosive feeling of energy in motion, reaching towards us from its centre. Striking and pure self-generated energy to lighten up and blow away the heaviness of everyday life. Material laser-cut powder-coated alumium. Colour: White. Designer Achille & Pier Giacomo Castiglioni. 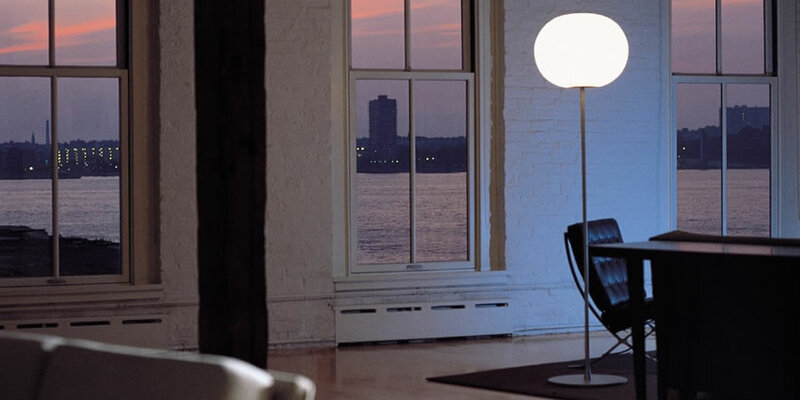 Floor lamp with indirect light. Base of sheared and bent steel and structure in steel sections, both painted in liquid, in various colors. Stem with hexagonal section in nickel-plated brass. The telescopic movement of the rod allows the height adjustment of the device. On the cable there is an electronic dimmer that allows the regulation of the light intensity in steps. Designer Enzo Calabrese - Davide Groppi. Sampei is the idea of putting the light on the floor or on the table. Sampei is also available in the outdoor version. Compasso d'Oro ADI 2014. 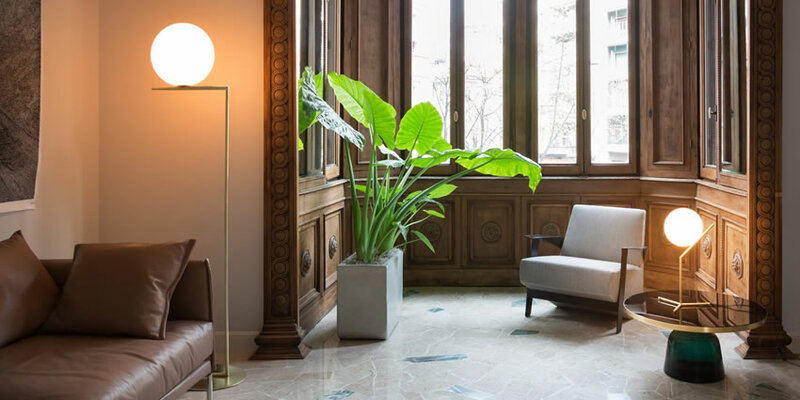 Significantly sized and with a seductive and slender design, the Mite floor lamp is made with an innovative mixture of fibreglass and carbon thread or Kevlar® that acts as both decoration and frame. Winner of the ADI Compasso d’Oro award.